I suppose it seems to many of my friends that I will fast at the drop of a hat. I suppose that is true in a way. I have found that fasting cuts off the fat of one's life. Oh, yes, it will cause a loss of body fat, but I am referring to all that unnecessary stuff that we tangle ourselves into while rationalizing their necessity. I have done many fasts over the last twenty-some years up to fifteen days and many more for less days. I have fasted one day a week, Wednesday, for over three years, which I used to do on Mondays years ago before we had the Princess. Last year, at this time actually, was the first time I have ever fasted for 40 days and it was far more enlightening on so many levels! During any fast past two days my energy level drops down, but during the 40-day fast this was not just a few days and then I pick up where I started and life goes on. 40-days is just shy of six weeks. It is a long time and life goes on during it. My husband still had to work and I still had to do my duties at home, especially with a child to homeschool. I found myself budgeting my energy, streamlining what absolutely had to be done, and just letting the rest fall away. Even the energy I would have spent angry about something did not seem worth the effort and the desire to pray peacefully replaced it. The world dims, the spiritual awakens. Although I do it regularly, I do not really enjoy fasting...but I just absolutely love the benefits of it. I have written about fasting many times here so you can look up some of my past posts here. Today is the last day of a 7-day fast. This one was devoted mostly to my daughter. 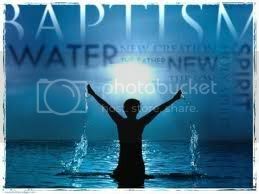 You see, she has been talking of being baptized for many years, but we were not certain she was spiritually ready. I believe that she loves the Lord and will readily explain her beliefs against the Big Bang Theory, but she just did not seem ready in some ways to us. But then do parents ever really feel their child is ready for the things she thinks she is? Then there was the thing that she was afraid of putting her head under water. Two Sundays ago, my daughter walked up to our pastor and asked to be baptized. This was one of the signs for which I had been waiting to show she was ready. So, the date has been set: August 21. It will be done at a member's pool and a celebration will follow, that is a pool party with eats. This date comes just seven days after our wedding anniversary. The Princess was also born seven days before my husband's birthday. I am not superstitious, but it just seem that seven could be significant and I had a strong desire to fast for seven days. Biblically, it is believed that the number seven stands for spiritual perfection. We all have been praying that God will prepare her heart and I have been praying for her to surrender to the Holy Spirit or as the Nazarenes would say "to become sanctified." (You can read an early post on this: Surrendering.) I am praying it will be a spirit-changing experience for her and that she will hold it dear all her life. This is why I am fasting. To cut the fat away in my life asking the Lord to do the same for my Princess so that the Spirit will awaken in her.